With an instantly-identifiable chunky appearance and their groovy retro lettering, Tecnica's Original Moon Boots® are an Italian-born footwear icon, and I recently had the opportunity to finally try a pair out -- something I've wanted to do for most of my life. And when I say most of my life, I mean it quite literally, as Moon Boots have been around since 1970 -- only a few years less than I have. So, I've always had a thing for the way Moon Boots look, but, having never actually owned a pair, it was just a physical attraction. And while you might think that sort of long-term relationship -- even though it was only a one-sided thing -- left me predisposed to liking them, I've actually found the opposite to be true: the more expectations you put on something, the more difficult it is for those expectations to be met; any little problem, and you can't help but feel disappointment. Having said that, let's first address my initial reaction to the Moon Boots. After having seen them in magazines, stores, and on websites for years, I wasn't sure they'd look as good in person, but I was happy to find that they looked even better on my feet than they did in photos, and that's the basic black version. I can only imagine how divine they would look in red, pink, or -- be still my heart -- the rainbow version. 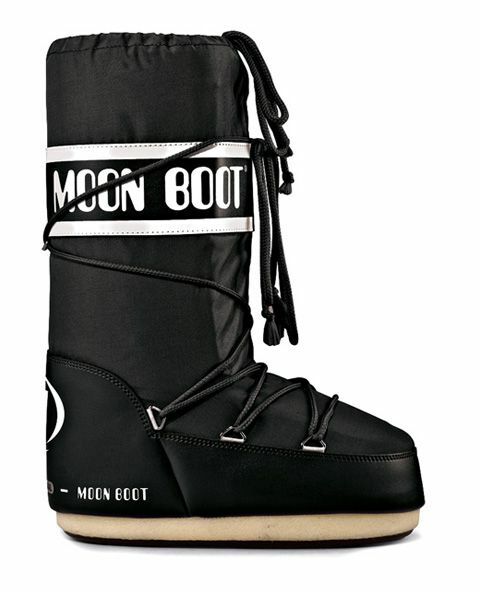 So, yeah, looks-wise, Moon Boots definitely measured up to my very high expectations. When I had stopped admiring the way the boots looked and decided to actually put them on, I was surprised to find that there was no right or left version. Both boots looked identical. I searched inside and out for some sort of mark indicating which was which, but there was none to be found, so I finally just stuck my feet into them, and it seemed to work out okay, though I couldn't have anticipated what happened next: a laughing fit. That's right, once I had actually put them on, I couldn't stop laughing at how they felt. For one thing, I felt about a foot taller -- which was cool and weird at the same time; I also felt a little bit "floaty," as if I might topple over. I'm sure this feeling comes from all the midsole padding. Yes, I should have expected both height and "floatiness" -- I mean it's obvious in photos that these boots are seriously chunky, but it's still an odd feeling that is really difficult to explain. I also think the floaty, funny feeling I described was exacerbated by the fact that the boots were a bit too big -- which brings me to the issue of sizing. Moon Boots Sizing : How Do Moon Boots Fit? Moon boots aren't available in half sizes, or even whole sizes. Instead, each "size" actually covers a range of sizes, kind of like slippers do. With some shoe styles this wouldn't work at all, but given the bulky, padded , and adjustable, nature of Moon Boots, it's not too much of an issue, but it's definitely something you need to be aware of; and if you fall on the edge of one of their size ranges, you may have difficulty choosing which Moon Boot size to choose. Based on my personal experience, if you fall at the bottom of their size range, I'd recommend moving down to Tecnica's next size. If you fall in the middle or the top of their range, then you should be okay going with the suggested size chart. Once I adjusted to the very unique experience of wearing Moon Boots, I found them to be extremely comfortable, and within a few minutes of walking around in them, I found I was actually having fun -- which is a feeling I don't normally associate with a new pair of winter boots. The only thing that still felt odd was being so much taller without wearing high heels -- but again, this was a good thing. Another thing that really pleased me was the fact that each Moon Boot has two means of adjustment: a regular front lace that crosses the vamp and runs halfway up the shaft; and another drawstring at the top opening of the boot. The bottom laces brought the boots in tighter around my feet, making the boots feel much more secure, and not quite so much like I was swimming in them. The top drawstring further enhances the fit, but is also ideal for keeping cold, snow and rain from reaching your calves or feet. With nylon uppers and lined with thick foam, the original Moon Boots are water-proof and warm, but since we're having an unusually mild winter in my part of the world, I can testify more to their dryness than I can to their warmth. I've worn this pair of boots in moderately cold, mildly snowy, and extremely wet conditions for more than a month now, and my feet have felt warm and toasty, and dry as a bone. Because of this review, this winter has been the first time in my life I have actually found myself wishing for more snow and colder temperatures: I wanted to really put these boots through their paces. But, at least, I can whole-heartedly recommend them for moderate winter conditions. The boots used for this review were sent to me by Tecnica, and will be donated to charity after completion of this review. 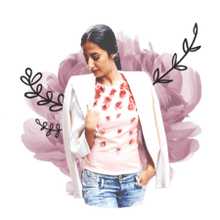 So, the real acid test is this: Will I buy a pair for myself? Definitely. Would I recommend Moon Boots to a friend? Absolutely, but only if they were looking for a pair of fun and trendy boots that happen to serve a practical purpose. If coolness was less of a factor, and they were looking for very practical, weather-proof boots that need to see them through sub-zero temperatures or other extreme conditions, and/or needed them to last them for years and years, I'd probably steer them in a different direction.